Providing your company has chosen to set-up auto responders on the account, you may also send personalised emails to multiple candidates at any one time.. So, your grouped and sorted list of candidates (depending on the volume of applications), should now look like the following image. You can see they are now arranged into ' Rejected', 'On Hold' and 'Invite for Interview' statuses. Responding to all candidates uses the same principal, no matter which status has been selected. Unfortunately, we have had a very large number of applicants, and we have not considered you for this position. I wish you all the best of luck in your job search. Use the drop down menus from the colour bars at the top of the Aptrack display window. By selecting the body of the text ' Reply - Auto-responder', you will send out the personalised rejection email that specific candidate. Please note: You do not need to select the checkbox in the dropdown menu. If the checkbox is selected, you will be changing the default action for that particular status. For example, if the Auto-responder option here is checked, you will always send an autoresponder everytime the 'red' status is selected. To send Autoresponders for any other status, just do so in the same way. 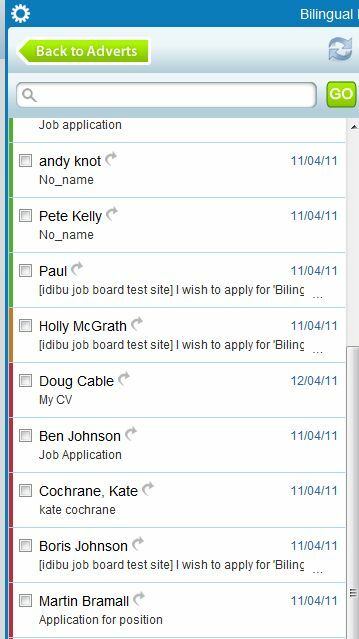 Colour group your candidates, then (if the autoresponder option is available) just select from the drop down menu. Don't forget to use the refresh icon to tidy up and sort your candidate list. 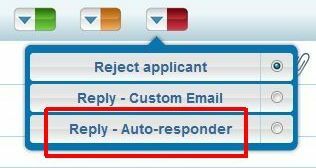 To send other types of response, please see the 'Responding to your Applicants - Custom emails' article.